The Big Bad Wolf Books Sale, the world’s biggest book sale, will debut in Dubai — and this thriller has all the makings of an instant classic. 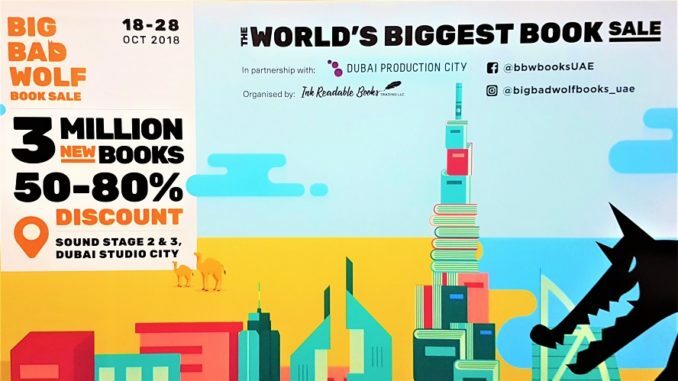 The first-ever Big Bad Wolf Books Sale Dubai, held in collaboration with Dubai Production City, will run at Dubai Studio City sound stages 2 and 3. From 18 till 28 October 2018, over three million, brand-new, mainly English and Arabic-language books will be available at huge discounts 50-80 per cent below recommended retail prices. Open 24 hours a day for 11 consecutive days, selected invitees will also have the chance to attend a special preview of Big Bad Wolf Books Sale Dubai from 10am to 11pm on 17 October, a day before the event opens to the general public. Thousands of passes to the exclusive VIP Day will be given out through contests on the Big Bad Wolf Book Sale’s social media pages. 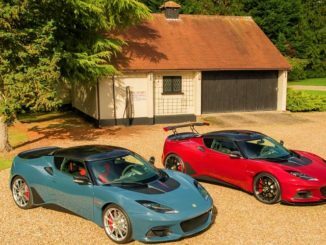 “We have had Dubai on our radar for a while. 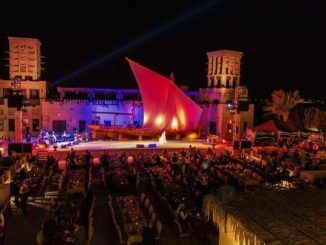 We understand that establishing a knowledge-based economy, nurturing the next generation of readers and promoting the UAE as a global capital of culture are in line with UAE government objectives. Our goal for the UAE is very much hinged on this vision – to encourage reading, changing the world one book and one reader at a time. 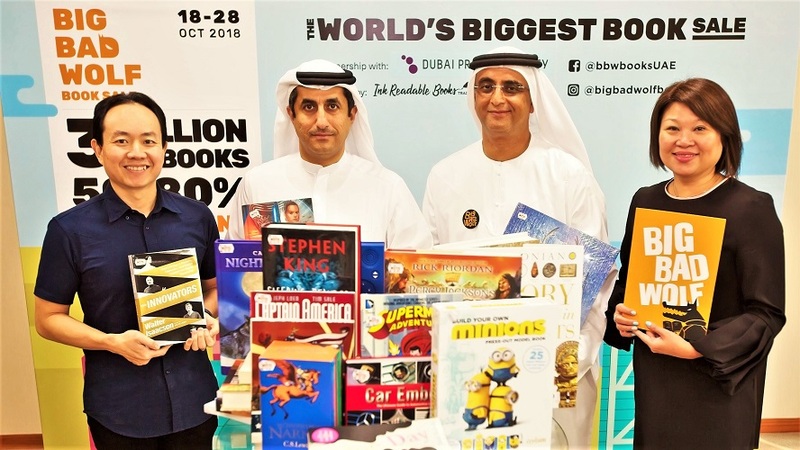 Our books are high-quality, very affordable and we hope our presence in the emirate will encourage more and more people to cultivate a culture of reading within their families and communities,” said Mohamed Al Aidaroos the Managing Partner of Ink Readable Books, the Organiser of the Big Bad Wolf Books Sale Dubai. “It is a known fact that books enhance imagination and creative thinking, vocabulary and overall communication skills. 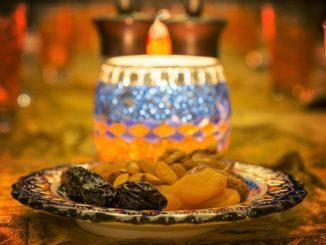 With more than three million books coming to Dubai, we’re confident that we have something for everyone – the architect, the chef, the gardener, the travel fanatic and those hunting for books by their favourite authors – and anyone else who wants to escape reality through the wonderful adventures found in books,” added Al Aidaroos. The Big Bad Wolf Books Sale Dubai will house books for readers from all walks of life. From bestselling novels and influential business books, to art and design titles, cookbooks and an unrivalled range of young adult fiction. Parents are also in for a wallet-friendly treat as the book sale will feature an extensive range of books for children, including story books, activity books, board books, colouring books and augmented reality books. Founded in 2009 in Kuala Lumpur, Malaysia, the Big Bad Wolf Books Sale has been to multiple Asian cities in the last decade, including Jakarta, Manila, Cebu, Colombo, Bangkok and Taipei. Dubai’s very own Bad Wolf Books Sale will mimic its predecessors’ accessible and affordable appeal by tapping into avid readers and occasional page turners alike, all in the quest to boost reading levels. For its Dubai debut, Big Bad Wolf Books Sale Dubai has partnered with Mohammad Bin Rashid Foundation (MBRF), the National Media Council (NMC), Dubai Production City, and Careem, the leading ride-hailing app, which will be offering its existing and new customers 25 per cent discount on four rides per person to and from the Dubai Studio City venue during the sale. Majed Al Suwaidi, Managing Director of Dubai Production City, said: “Our partnership with The Big Bad Wolf Books Sale Dubai reflects our commitment to support platforms that encourage and facilitate more and more people reading. Our community always intends to emphasise on leadership, highlighting the significance of knowledge sharing as a tool to develop nations. “The National Media Council (NMC) is committed to encouraging reading through its support of the UAE’s National Reading Strategy, a programme that extends to 2026. The Council’s activities under this plan include the ‘National Figures for Reading Initiative’, which highlights the books and reading practices of some of the country’s top ministers and officials; ‘Pen Print,’ which motivates community members to visit libraries located in commercial centres; and the ‘Heroic Literature Initiative,’ which documents the brave deeds of UAE martyrs that are a source of pride to our nation,” said H.E. Mansoor Mansoori, Director General of NMC. “In addition to promoting reading at the user level, NMC also supports greater access to books by enhancing the UAE’s publishing and printing sector. Initiatives included in this approach are the ‘Age Classification System,’ which categorises the content of books according to their suitability for various age groups and the ‘Self-Follow Up Programme,’ which allows publishers to effectively evaluate their book circulation. Through these and the other array of services we offer publishers, our ultimate goal is to ensure that reading is viewed as an important community habit and one that is an integral component of the UAE’s national identity,” His Excellency added.